It feels like I'm reliving the waiting and wondering when and how Lily's birth would unfold. There was so much excitement and anticipation. Only now I know what happened and when and how it did. And there is no way to ever change it. 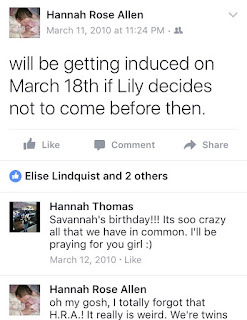 My mom and I were talking this morning about how on this day in 2010 (March 11th) was my last appointment and the last time we'd ever hear Lily's sweet heart beating or see her alive on the ultrasound machine. Here is an ultrasound image from that day. It's difficult to tell what you're looking at when the baby gets that big, but my friend Amanda who does ultrasounds told me her head/profile is on the left and her chest is on the right. 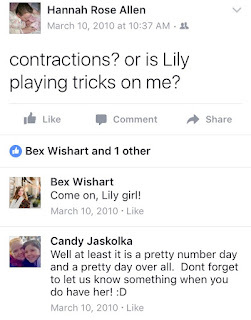 I was scheduled for an induction date of March 18th if Lily hadn't come before then. I still have the paper with the induction date on it (it's now in Lily's scrapbook). This popped up on my Facebook Memories today... my post from this date in 2010. 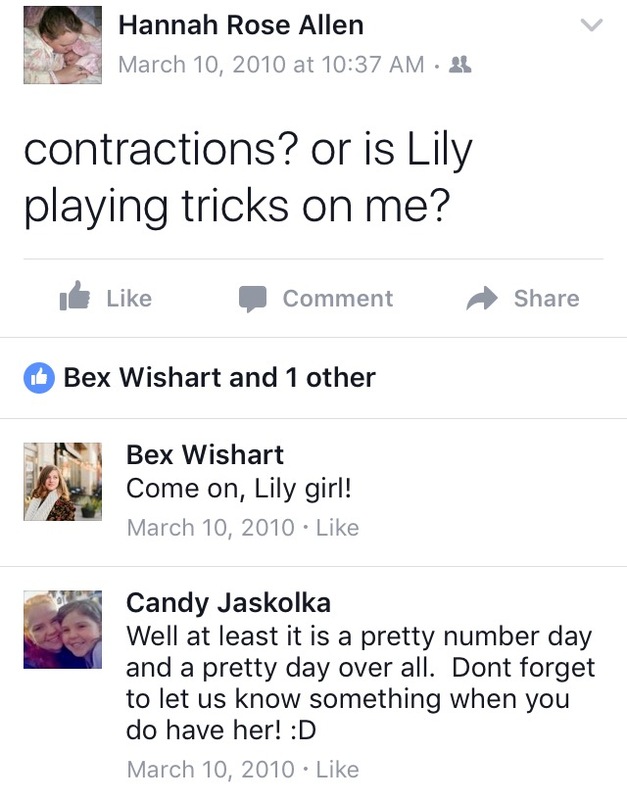 And this is what I posted on yesterday's date in 2010... if only those had been real contractions and she had been born then. What is so bizarre is that on that day, my mom was concerned that something was wrong with Lily. She was with me during the ultrasound and said it looked like Lily's head was smushed and her entire body slouching over, like she had no energy. The doctor called us in to discuss the induction date, but before we knew what he was going to say, my mom thought he was going to say there was something terribly wrong. I don't remember if she ever mentioned that to me at the time. Honestly, even if she had mentioned it, I probably wouldn't have been too concerned. I never considered Lily dying as a possibility whatsoever. Before losing her, I don't even remember hearing or knowing the words stillbirth or stillborn. I saw something I wrote about it shortly after I had Lily and I didn't even use the word correctly. Anyways, my doctor said everything was perfect at Lily's appointment. Her heart was beating steady and strong and it was just a matter of waiting on Lily to make her entrance into this world. Should my doctor have caught something? Did he miss something that might have saved her life? 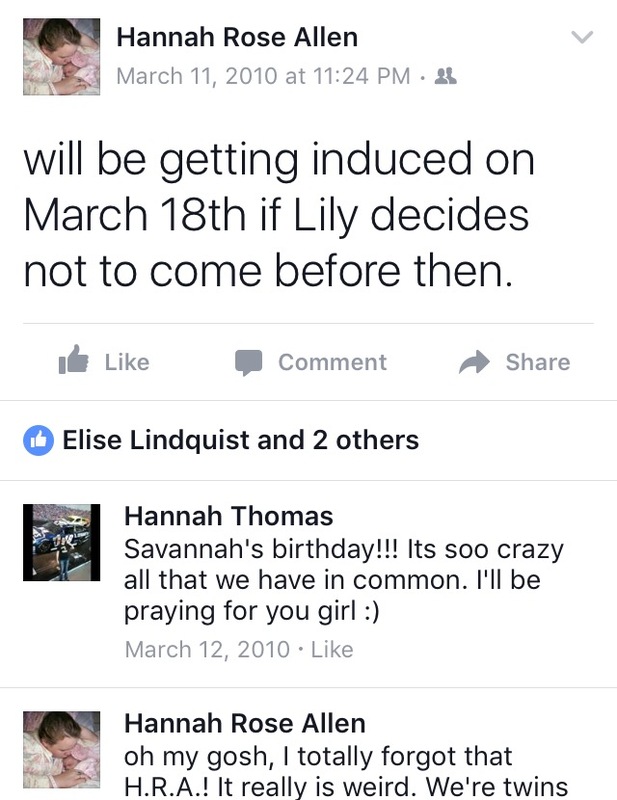 The next day, March 12th, is the day that I had guessed Lily would be born when we made our birth predictions. Now, it's the day we believe Lily was born into Heaven. The reason we think that is because I started having a lot of sciatica pain and it felt as if Lily was floating in my stomach. I have had people ask how I didn't know she was gone, but it was my first pregnancy. How was I to know what was normal and what wasn't? I assumed she had gotten so big and ran out of room and that's why I didn't feel the kicks and punches like I once had (that's a common myth by the way). And I did feel movement, though looking back now it was such a strange feeling. Floating is the only word I can think of to describe it. It's a sad memory. My mom said she kept asking me that weekend if I felt Lily moving because she was concerned. I assured her I did. She had not asked me that my entire pregnancy, so it's strange she started asking me then. If I had gone into the hospital because of lack of movement, might Lily have survived? I cannot allow myself to be consumed by these thoughts and questions. On March 12th, my mom had a very strange feeling that Lily had died. Later, when she told one of her friends she had thought that, her friend said she thought the same thing on the same day. There was nothing to make them think that, but they did. I find this so strange. This entire week holds many memories. Today is the day I think about how if Lily were born on this date in 2010, she would be alive. We'd have the birthday girl here to celebrate and I'd be able to share photos from her party on a blog about her life, rather than a blog about her death too. It makes me terribly sad to think this is the last full day she lived on Earth. Why couldn't my body have gone into labor before it did, before she died? If she'd been born today, if today were her birthday, she'd most likely be alive. That's a hard truth to grapple with. I missed meeting her alive and having her here with me (hopefully for the rest of my life) by just a few short days. I remember that "floating" feeling Maddison Faith heart stopped 06-24-07 she was born 06-27-07. I'm sorry for ur loss. My rainbows name is Phoenix Lily.